File image of UC Board of Regents at a 2014 meeting. 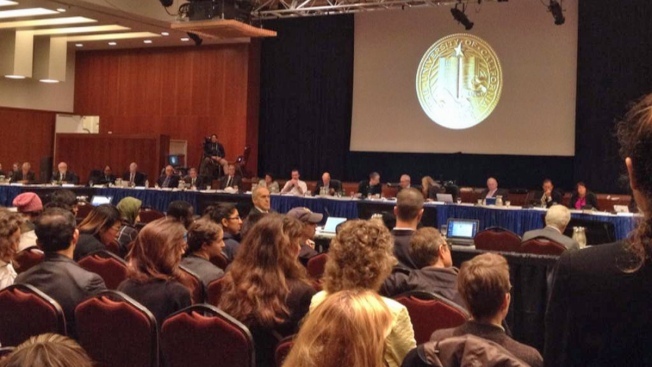 The University of California Board of Regents is expected to consider a plan to increase tuition for the first time in six years. University of California officials unveiled the plan Wednesday, saying that the proposed increases would be a modest way to boost mental health services, financial aid and faculty hiring. Students currently pay $12,294 a year in tuition and fees. The proposal calls for a $282 increase in tuition and $54 increase in fees, bringing the new total to $12,630 starting in 2017-18. UC spokeswoman Dianne Klein said financial aid would cover the increases for two-thirds of the system's California undergraduate students. Critics have said higher tuition would put too much of a burden on students already struggling to finance their educations. The Board of Regents meets Jan. 25-26.